Kingdom Hearts 3 Sequel Pitch: What Could Happen Next? 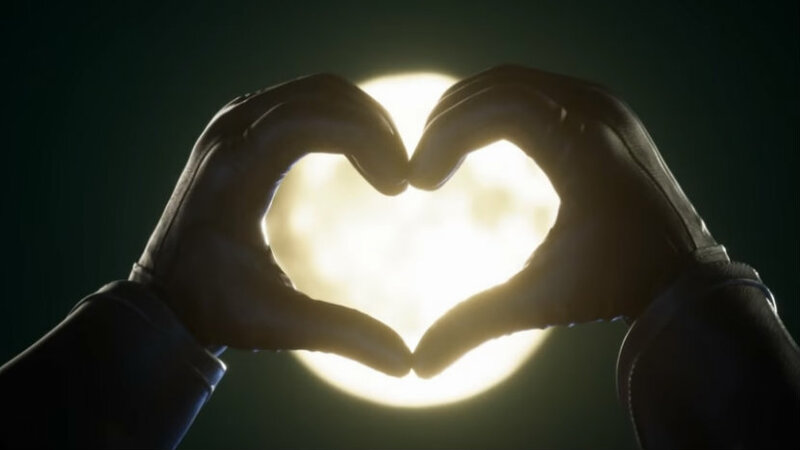 Ok, first of all, like with all the rest of our Kingdom Hearts content since the Kingdom Hearts III review date, consider this a spoiler warning. We’re about to get into ending stuff, and there’s no avoiding it. If you want to engage with this nonsense, finish the game first, then either suffer through the Lucky Emblems or fire up that secret ending on YouTube so you can follow along. Alright, it’s time to talk about what’s next for Kingdom Hearts. After all, Director Tetsuya Nomura himself is out there dropping hints already, particularly in a recent interview with Dengeki that straight-up confirmed we’re getting a “Final Mix” of sorts via DLC before the end of the 2019. We also know, based on both historical precedent and teases from Nomura, whatever comes next isn’t going to be “Kingdom Hearts 4.” Not yet, anyway. What could it be, then? The next Kingdom Hearts, specifically the game (at least the first game) between III and IV, is set in the “real” world. Kingdom Hearts III, before all the wacky epilogue stuff kicks in (which I’m leaving for PSLS staffer Aidan Simonds to deal with elsewhere), leaves us off with Sora once again displaced from the Kingdom Hearts universe’s existential mockery of the mortal plane. Xehanort, who is now as dead as you can get in this twisted world, totally murked Kairi, and Sora used his power of “waking” on himself to get her back. He fades away during the bittersweet ending, and then the credits roll. That’s when things start to get weird, and Sora wakes up in freakin’ Tokyo. There is some speculation out there that whatever is happening in “Yoroza,” it’s connected to Nomura’s other brainchild, The World Ends With You. That’s nonsense, and I’m going to tell you why. It’s all about the direction here, how information is presented to us through both what’s happening, and how what’s happening is framed. You know, nerdy filmic language stuff. Sora wakes up in the middle of Shibuya, groggy and totally discombobulated. But we don’t know it’s Shibuya yet, and that’s important. Instead, everything is blurry and obfuscated, and we see things through Sora’s eyes for a bit. Riku appears to be here too, notably also waking up from some kind of comatose state. The first actual details we get are the hyper real, granular details of the asphalt as Sora gets up, then Riku sees a traffic light, then Sora pivots towards a parked car in an actual panic. Right away, we as the audience are being told something is wrong here, that these mundane visuals to us as real-life humans are not to be taken for granted. 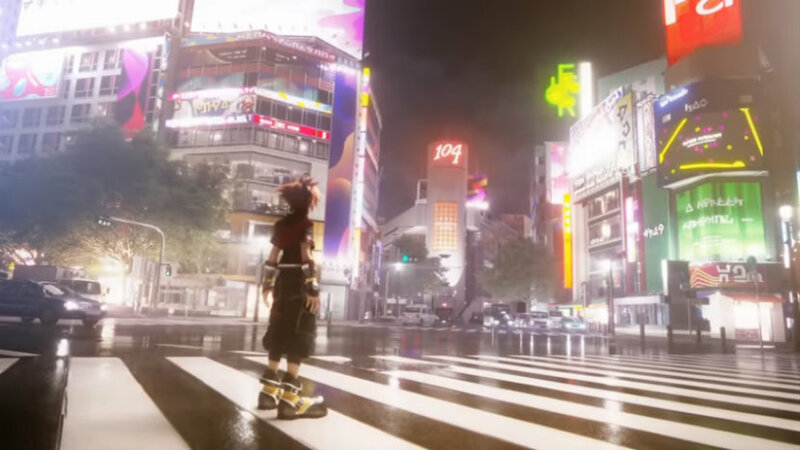 As the dramatic music kicks in and and the camerawork gets fancier, it’s revealed that Sora is standing in the middle of Shibuya crossing, and Riku is looking up in awe at the Tokyo Metropolitan Government Building in Shinjuku. These fools are in Tokyo, like, the real thing. As a quick aside, yes, I know the number on the famous Shibuya department store building is 104, just like in The World Ends With You. I’m calling that a coincidence. See, 109 is the name of a department store, meaning those numbers are likely associated with a copyright. With the stylized world of TWEWY (which is already represented in the actual Kingdom Hearts domain, mind) needing to use that tower, the “104” is likely a way to cheese the trademark. You can see a similar example in Nintendo and Atlus’ Tokyo Mirage Sessions, which uses a “106” instead. 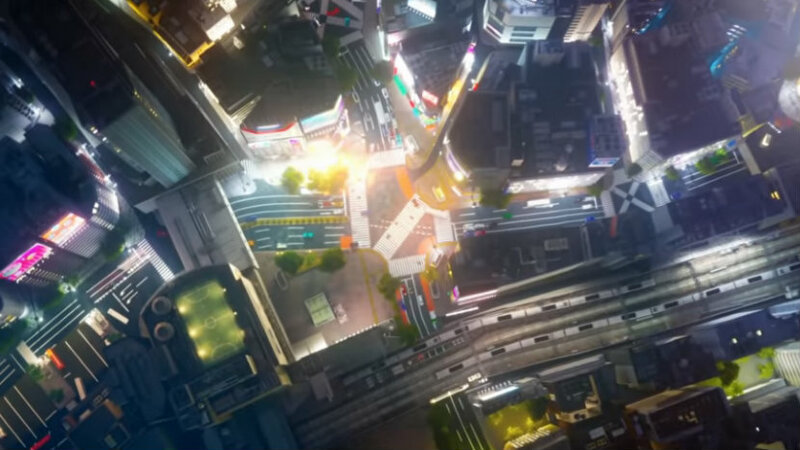 As Sora and Riku gawk at their respective landmarks, the camera jarringly zooms way the hell out to a bird’s eye view of Tokyo, as if to hit us in the face with a baseball bat labelled, “FISH OUT OF WATER STORY.” Now that we’ve established we have jumped from Disney and Final Fantasy worlds strung together by anime magic to the much less magical real world you and I inhabit, what’s next? Well, here’s the part where I start making stuff up. The most important part of all this, to me, is how heavy the vibe of “this is not the way things are supposed to be” is in this video. See, travel between worlds is already established in Kingdom Hearts, right? We’ve seen it done multiple ways, and we’ve even seen movement in time and space, between parallel worlds, and whatever the hell else Xehanort was doing this whole time. But there has always been a vessel, especially for the heroes. The keyblade armor in Birth By Sleep, the Gummi Ships, that technique Yensid taught Mickey to get around safely, so on and so forth. Here, Sora and Riku are waking up like they crash-landed somewhere outside of their control. And what the heck is Riku doing there? I think this is all related to the ending of Kingdom Hearts III. Sora once again turned the power of the keyblade onto himself, in order to save Kairi. The first time he did it, he turned into a Heartless, setting off, well, a huge mess. This time, Sora seemed to just disappear off into the sunset, Top 10 Anime Heartbreaks style. What if Sora blasted himself right out of the known universe this time? It’s doubtful he had much control over the end result, after all. That doesn’t explain Riku, but we probably don’t have to go to great lengths there. 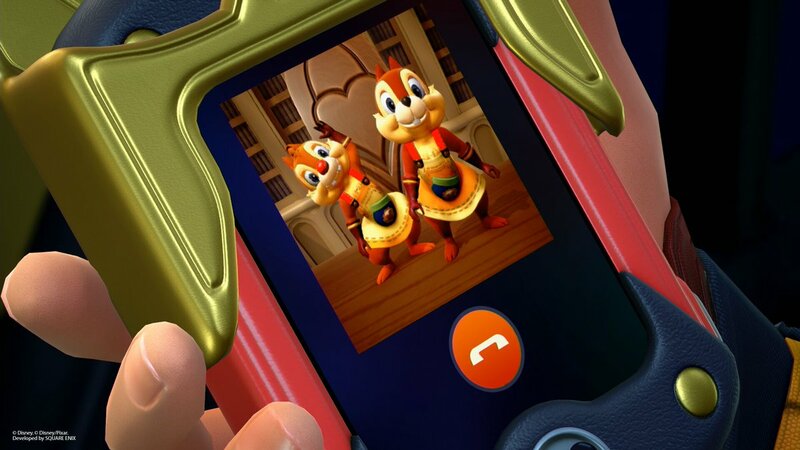 This is still a Kingdom Hearts game we’re talking about. Likely, since Riku is a Keyblade Master and all, the initial setup of this hypothetical semi-sequel likely sees Riku trying to find Sora and figuring out how to do what Sora did to himself. So Riku follows Sora, blasting himself out of his own timeline Terminator style, they both wake up in Tokyo, and boom. 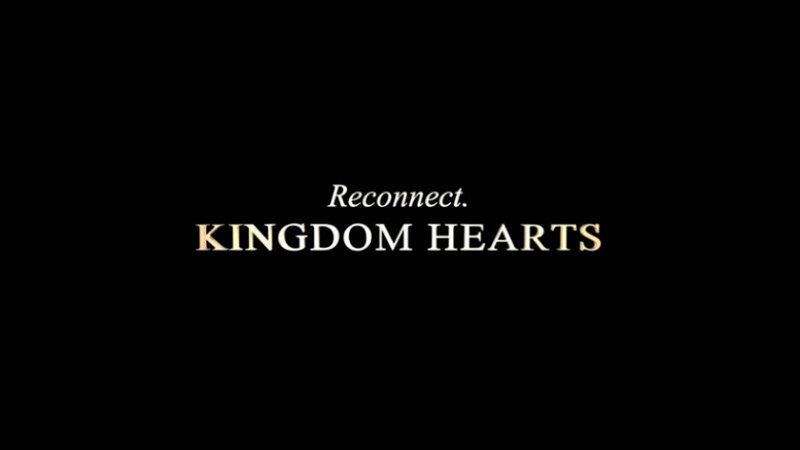 New video game, presumably one with the subtitle “Reconnect,” as in Sora and/or Riku reconnecting to each other and probably reconnecting their hearts to their bodies after recklessly separating them (again). But I’m not done yet. There are two more significant details in “Yoroza.” The first is, well, Yoroza. The main character from what was introduced as a fictional Square Enix video game in the Toy Story world in Kingdom Hearts III makes an appearance, sitting atop the Tokyo Metropolitan Government Building. This to me is likely a big, goofy red herring of sorts, or more of a hint to the sort of encounters the player will be having throughout the game. If Disney is back in the Kingdom Hearts universe proper, perhaps this is an excuse for Nomura to come up with more original characters, or maybe even we’ll be seeing more Square Enix cameos. It would be pretty cool to have Sora and Riku explore a larger landmass (Tokyo) instead of sailing a Gummi Ship between separated worlds, and maybe Tokyo is home to people like Yoroza, who exists only as a video game character in Sora’s universe. The second detail is the cloaked figure who makes that ominous heart shape with his hands over the real, human Moon. This is the least important detail in a lore sense, and probably a hint at the more immediate, video game-y threat. Basically, someone with some connection to the new Organization XIII, the weird animal mask people/Xigbar’s crew, or some new baddie entirely is out here too. Maybe they followed Riku, maybe not. But, well, here’s a new chance to make a brand new, otherworldy “Kingdom Hearts,” and the most dastardly way to do it is by blowing up the Moon. Fun! 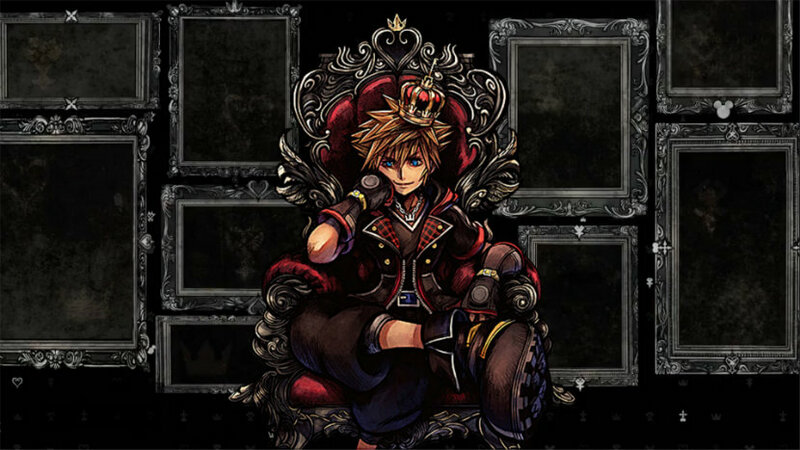 In summary, I think our next decimal-titled Kingdom Hearts sequel will be a direct continuation of Sora’s story, following up on what happens when you use the keyblade to sacrifice yourself to save someone else. This also turns Riku into the one searching for his friend this time, which is a nice twist on the earlier games’ stories. I think it takes place is some fictionalized, but deliberate, version of the “real” world, and I think whoever the bad guy is is whipping up a Kingdom Hearts-flavored Moon Bomb. Whip it up at a smaller scale, drop it on the PS4 and Nintendo Switch, and boom, you have Kingdom Hearts 3.5. Or 3.2, or something.